Our spectacular Château RiveSarthe is set in 52 acres of grounds on the banks of the River Sarthe. It is a thirty minute drive South West of Le Mans, situated close to the typical French village of Malicorne-sur-Sarthe. Built at the turn of the 20th century in the Belgium Herge Family style (of Tin Tin fame), the Château has 13 comfortable rooms catering for up to 32 people. Since then it has been owned by the French railways before being purchased privately around ten years ago. As well as the Château itself, the grounds offer a variety of accommodation including gites, chalets and camping facilities, ensuring a wide variety of group sizes and needs can be accommodated for. The Château is the perfect location to host events of any sizes including weddings, conferences and functions. There are four separate seminar rooms available, each seating 40-60 people. The chalet complex, ideal for small groups wishing to upgrade from camping, but still wishing to stay together. Each chalet consists of 2 twin bedrooms and 2 single bedrooms, and can sleep up to 6 people. 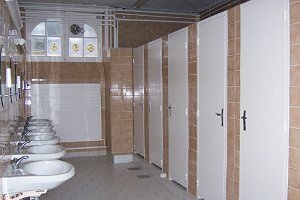 Each chalet has private use of WC, washbasins & shower facilities. 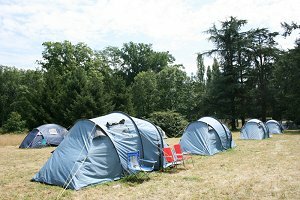 The Petit Village, ideal for people looking for an upgrade from camping, but still wish to enjoy the social benefits of staying with a group within the château grounds. There are 7 twin bedrooms, 1 double bedroom & 2 single bedrooms within the Petit Village. Most bedrooms have washbasins & all have access to WCs and shower facilities along with a large shared kitchen area. 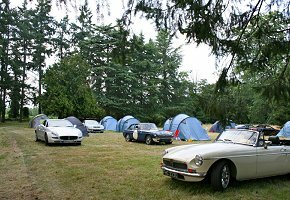 Camping in the peaceful, secluded grounds of the Château with toilet & shower facilities. Four separate seminar rooms, each seating 40-60 people.